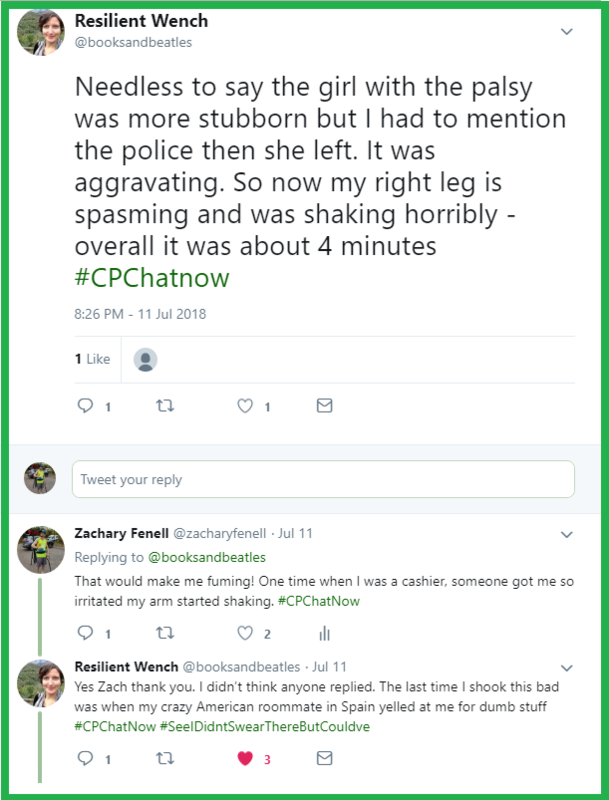 A frustrated tone proved present Wednesday, July 11th, 2018 throughout the live cerebral palsy Twitter chat #CPChatNow. I am co-host Zachary Fenell, here to recap said frustration. A current event triggered the early irritation. 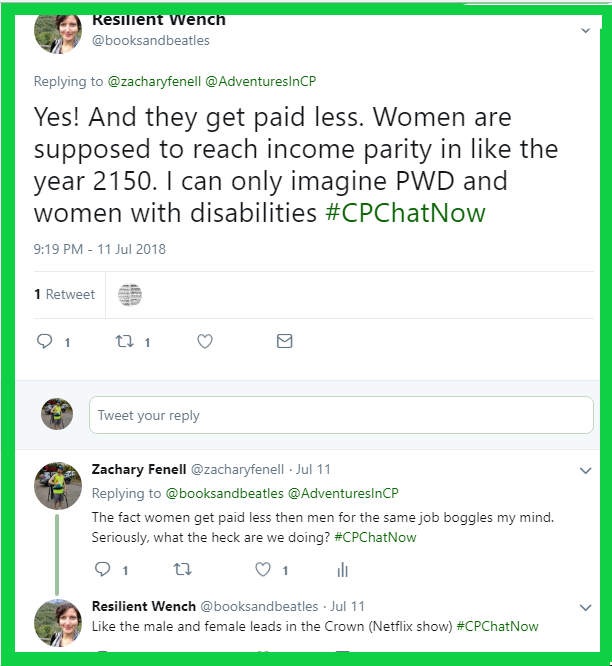 Regular #CPChatNow participant Seth made a humorous remark insinuating environmentalists do not care about disabled people. 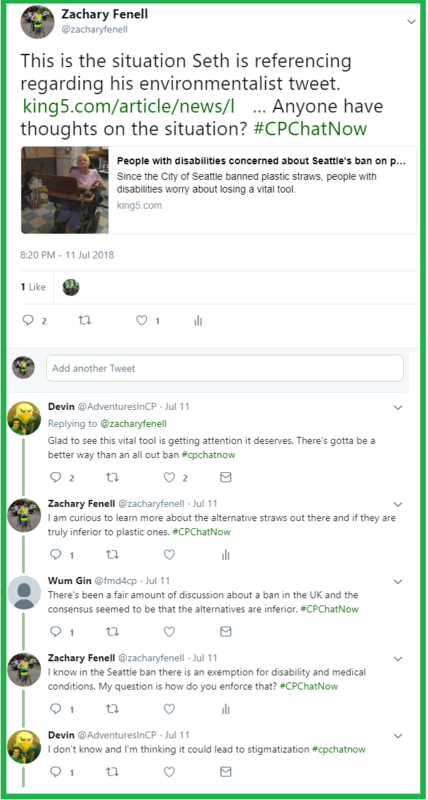 Recently up to date on disability related news, I offered context for Seth’s tweet. Hot topic news stemmed from Seattle banning plastic straws. Such a decision remains controversial because many with disabilities need the object my co-host Devin called a “vital tool.” I shared an article discussing the aforementioned plastic straw ban, which led to insightful conversation. Personally, the news piece stimulated my curiosity. The coverage mentioned alternative straws, an item drawing my intrigue. Participant Wum Gin echoed sentiments that such options cannot compare to how plastic straws perform. To the Seattle ban credit, they incorporated an exemption for disability and medical conditions. The question arose though, how do you enforce the exemption? No real answers surfaced. Instead the dialogue unraveled, leading to further disheartening issues. Our beloved “Resilient Wench,” Rachel, thought in some cities you can receive a $250 fine if found using a plastic straw. Devin believed those fines applied to businesses, oppose to individuals. He even commented “I don’t see how they can stop an individual person from using a straw, but who knows.” I can confirm courtesy a CNBC report the $250 fine does indeed apply to businesses, NOT the individual. Information I obtained while researching the plastic straw ban prior to publishing today’s recap. Unfair employment practices especially impact women with disabilities, a factor Rachel highlighted. Between the gender pay gap and employers discriminating against disabled job applicants, women with disabilities sadly confront multiple injustices in their job seeking efforts. Truly infuriating! So upsetting you might find yourself angrily shaking. Both Rachel and I recounted personal experiences where an aggravating situation left us shaking. Do you relate? Answer for the week’s extend-the-conversation question, “How does getting angry affect you physically?” Share in the “Comments” section below. Well, looking back I realize July 11th’s chat contained a highly negative focus. Nevertheless we talked over important matters. 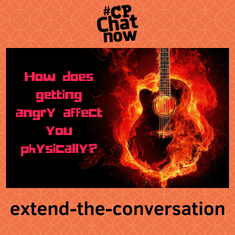 I think #CPChatNow thrives because we don’t let the tough subjects intimidate us. Make sure to join us every Wednesday on Twitter, starting at 8pm ET. Tweet you then!